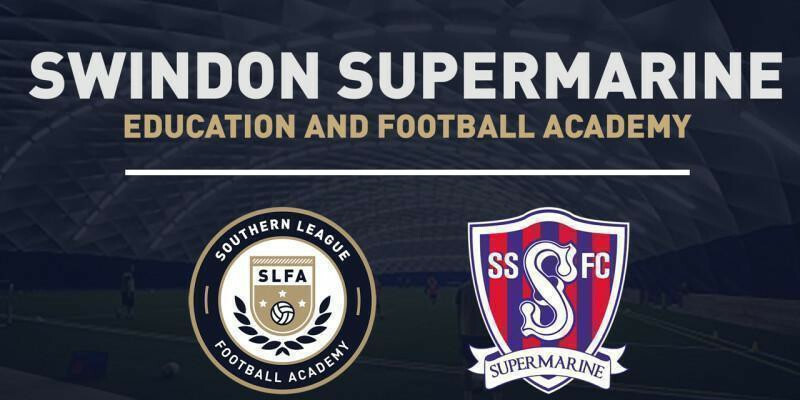 Swindon Supermarine are delighted to announced that they have joined the Southern League Football Academy (SLFA) -the brand-new education and football academy of the Evo-Stik South. An Education and Football Academy side for 16-18 year olds will be created at Swindon Supermarine and play in the SLFA with opportunities to play in the FA Youth Cup from September 2019. The Swindon Supermarine Academy is a full-time course which is an alternative to college where students will study for a BTEC in Sport at Level 2 or Level 3 (Diploma and Extended Diploma available which is the equivalent to two/three A Levels) which will be delivered by a tutor in the mornings before a UEFA qualified football coach will train the students in the afternoons as well as manage the side on Wednesday afternoons against fellow SLFA sides such as Frome Town, Chesham United and Yate Town. All games will take place at the main grounds of all the Evo-Stik South clubs involved and filmed for analysis with the weekly highlights show that is published every Friday evening. It’s sister programme – the NPLFA - has been a huge success on and off the pitch with over 750 students enrolling over the past four years and many of those progressing onto university, scholarships in the US, the programmes own sports degree course or employment and as of October 2018, fifty students have progressed to their respective first teams with two students progressing to the professional game and that success will now be implemented in the South. By being a part of Swindon Supermarine, there are genuine pathways to play for the first team and with the football programme being held between Monday and Friday, students will still be able to play for their local junior sides at the weekend. Jez Webb, Chairman of Swindon Supermarine commented. “We are very proud to be joining the Southern League Football Academy and assisting local students in both their education in sport and football development. “We built the Swindome with a vision for it to become a centre of sporting and educational excellence and the SLFA fits perfectly with our ambition for the Swindon Supermarine Football Club and its role in the local Swindon community. “We recognize how important it is for young footballers to have the best education they can, not only in football coaching but all the other aspects of a young sporting person’s life. Manager Lee Spalding commented, “As a father of two sons who have progressed through an Academy process, I know first hand how valuable the education process and how rewarding an Academy process can be to developing the lives of young sporting students. “As first team manager at Swindon Supermarine FC, I see this Academy as a great benefit to both the club and its development for the future. The facilities at the Swindome where the Academy will be based are second to none and It will provide the perfect environment for the Academy to be a great success over the coming years. There are a maximum of twenty-two places available for the Swindon Supermarine Academy with trials to be arranged in October 2018, December 2018, February 2019, April 2019 and May 2019. The first trial will take place on MONDAY 29TH OCTOBER, from 1.30PM – 3.30PM at SWINDOME, SUPERMARINE SPORTS GROUND, SUPERMARINE ROAD, SOUTH MARSTON, SWINDON, SN3 4BZ. Trialists will need to bring full training kit (your own), shin pads, boots which MUST BE CLEAN and suitable for a 3G surface e.g. screw in studs are not permitted, trainers for the gym and a drink.